OK, so this is a kid's book, however, it deals with kid's and adult's themes and sometimes, both are the same. James Edward Bristlefur is cat to his super, secret spy companion, Sir Archibald. After successfully completing an assignment, Sir Archibald retires to home to celebrate with a biscuit (cookie), but chokes as the biscuit is poisoned. Bristlefur is then sent to Norway to be with Archibald's secretary's sister who has agreed to take the cat. Bristlefur believes this is exactly what he needs to catch Sir Archibald's killer because the biscuit he choked on came from some place in Norway, evidenced by the tin's picture. However, he gets lost en route and ends up in New Jersey and soon adopted by a family. Unfortunately, they decide to call him Mr. Stink. Recon reveals the family just moved here and Aaron (Mr. Stink's boy) is being bullied by Kyle. Bristlefur learns the father is leaving via an airplane which means the airport which means Brisltefur might hitch a ride to Norway and uncover Sir Archibald's killer. Yet on the moment of escape, Bristlefur has a change of heart and decides to stay and help the young boy. Through paying off the mice, he manages to scare Kyle before publicly humiliating and nonchalantly "taking care" of the mouse in front of all the other kids, thus making Aaron look cool and Kyle look like a sissy. 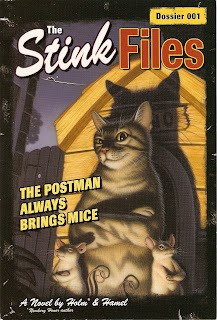 Later, Bristlefur finds out the culprit, responsible for Sir Archibald's death and framing Mr. Stink for nefarious deeds in the house, resides in New Jersey. While this is geared for ages 9-12, I think adults can enjoy it as well, I did. The story deals with themes many can relate to: loss, looking to belong, being bullied, grief, companionship, etc. Bristlefur starts off as aloof and stuffy, perhaps due to his raising by Sir Archibald, but learns to warm up after spending time with Aaron and family. I think telling the story from the cat's perspective was good and giving the cat a mystery to solve charming, which is still unsolved. As far as I know, there are three in the series, To Scratch a Thief and You Only Have Nine Lives. does the title have anything to do with the story? i'm guessing not, but that's still a clever take-off on a well-known movie. Actually, it does, kind of. Bristlefur devices a plan for the mice to chew on things that arrive in the mail for Kyle in order to freak him out. From Kyle's stand point, the postman did bring mice.